Bought: Virgin Oxford Street 1988? 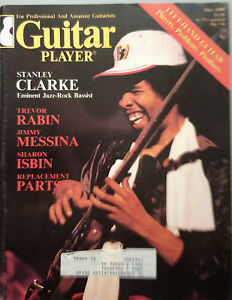 Stanley was and is one of my all-time musical heroes. As a teenager, I loved his fiery bass playing, dramatic compositions and dynamic hook-up with drummers. I first heard about him from my dad who bought his classic 1974 debut album on cassette in the mid-‘80s. As a burgeoning young drummer, I was immediately blown away by Tony Williams’ playing and also Stanley’s wide-reaching musical vision which took in funk, prog, post-Hendrix rock, flamenco, modal jazz and Third Stream. In 1979, Stanley recorded the sprawling, slightly directionless I Wanna Play For You double which veered uncomfortably towards disco on a few tracks. But it also featured some outrageous live recordings which suggested he was going in a more ‘rock’ direction, mainly thanks to the sonic possibilities opened up by putting his Piccolo bass (tuned a fifth higher than a standard bass, A to C rather than E to G) through various effects pedals. But how would Stanley start off the ’80s? on Rocks, Pebbles and Sand, he thankfully pushed the rock and prog-fusion rather than disco. It also really helps that it sounds very much like a ‘band’ project, apart from funk curio ‘We Supply’ which belongs on a different album altogether. And what a band it is – Simon Phillips on drums, Charles Icarus Johnson on guitars and Steve Bach on keys. Phillips in particular is a perfect foil for Clarke with his meaty grooves and superchops. Though he was obviously coming from Billy Cobham with his prodigious double-bass playing, expansive tom fills and open-handed style (see below), his grooving on ‘Story of a Man and a Woman Part 2‘ is just perfect. Rocks, Pebbles and Sand‘s opener ‘Danger Street’ sounds like Stanley has been listening to The Who and Van Halen with its big drums, raucous guitar and gargantuan riff. Subtle it ain’t (and one can take or leave Stanley’s vocals), but it really works, mainly due to the mastering and mix – Rocks is one of the best-sounding albums of the era alongside Steely’s Gaucho, Lee Ritenour’s Rit and Zappa’s Sheik Yerbouti. The duet vocals on ‘Underestimation’, ‘You/Me Together’ and ‘A Story of a Man and a Woman’ might put some people off, but isn’t that female voice familiar? A glance at the liner notes reveals a credit for one ‘Marcy Levy’ on vocals. 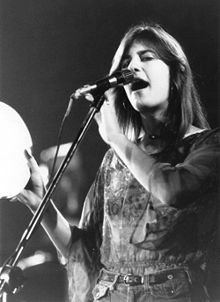 It turns out to be none other than Marcella Detroit of Shakespeare’s Sister fame, an LA session singer in another life who had recorded and toured extensively with Eric Clapton (co-writing ‘Lay Down Sally’) before working with Stanley. Stanley had a mixed ’80s to say the least, with a fair few misses but some big hits as well – watch this space for more of the latter.